Prusians Heroes Prominent Prusian Where you are, Prusai? After the fall of the II-nd Great Prusai Uprising in the year 1274, there were a few more minor freedom uprisings, one can call them as an armed rebellions without a well-organized leadership. The Prusai social structures were demolished by the Germans while they conducted the holocaust on them. Another important factor was the Prusai exodus to their neighbor’s land, most of them settled in Mazovia, Cuiavia, Pomerania, and the primeval forest areas of the north-eastern Mazovia, today called Kurpie. The North Prusai, and Jatviagans, obtained asylum in Lithuania and Russia. Refugees were the Prus active part of the community who in the frenzy massacres led by the Germans have lost any hope of saving their life. The arrival of German settlers after the Prusai second armed uprising decreased to such an extent, that in place of the murdered indigenous people, Order began to invite their neighbors. Among the settlers were Slavic serfdom refugees oppressed peasants, but during the first period of colonization the polonized Prusai natives were returning to their land. The Prusai of northern Mazovia and from other neighboring lands when returning, did it under a different identity, otherwise would be threatened with the same treatment as the remaining on the Prusai land population which been in total captivity. They were treated without any human rights. The Pomezanian province since the Dzierzgon peace treaty, were a subject to a different law, thanks to the episcopate of Pomezania, because they became their vassals. Immediately after the uprising, Teutons did an "order" with the leading Pomezanian families, removing them from their ancestral land into other remote areas (8 centuries later the same was done by Stalin) away from the centuries-old neighbors, to avoid any contact with familiar population and the next any anty Teutonic uprisings. These were the families who resisted the Teutonic Knights and who with them settled down the peace treaty. The rest if they were well treated was due to the Pomezanian bishopric. Many of them later moved out from the Pomezania to Culmland to a less controlled land by Teutons. The Prusai landowners, many times without a real reason, bestowed his working fellows a piece of land, to provide them with the better conditions, greater rights. Whatever, one hundred years have passed since the second Prusai Uprising, the Germanic barbarism by the Prus people had not been forgotten. 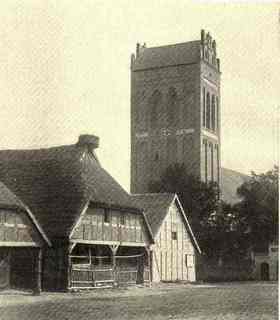 The Teutonic chronicler Peter of Dusburg left the posterity description of this barbarity and described it with a great pedantry. Reading his chronicle, the reader will find out, that without any doubt the German culture was born within Prus land, today known as the Holocaust. It did not escape the Prusai mind, and they were aware, that the next Germans aggression target will be Lithuania and Poland. Knowing that sooner or later will come to a final settlement between Germans and Polish Crown, Prusai were waiting for that as the moment for liberation. This situation was obvious after the Prusai conquest, and was maturing throughout the XIV-th century, the border region was at the boiling point. Not only the Prusai, but the Polish Crown was well aware of impending on its way the great armed conflict. The Prusai knights oath to the Order was obligatory to serve with them, on the 24th February year 1397 they organized the "Lizard Society": started by two Rynski brothers, Nicholas and Hanusz and two Kitnowski brothers, Frederick and Nicholas. It was not in Europe a novelty, that the knights for different intentions and purposes created such societies, thus their real intentions escaping excessive attention and suspicion from the Teutonic Knights. "Or disclosed our secret, or contribute to, that will be disclosed before had been so convinced that he should be expelled and forced out of the company, and away to be held without faith and worship, as convinced villain." We can ponder whether the four knights were elected by a larger group or was it their own initiative, or appeared as figureheads in the document not to arise any suspicion. The rest of the knights reading this document with God’s objectives, became engaged in the association without arising suspicion. Not to forget that the Crusaders were masters of intrigue and had to be outsmarted, one must admit that the Prusai had not failed in this, with the agility of a lizard, no one else could have a better understanding of the Teutonic Knights than the Prusai. This usually happens in history that the student surpasses the master - in this case, the Teutonic Knights. This view is also shared by Marian Bartkowiak: "Undoubtedly, the adoption of a lizard (agile and fast, able to hide) as the emblem of a relationship is very characteristic, also mentioned in the document of the penalties that threatened for revealing the inner secrets, testifies to this, that the company had, however, strived to implement some secret purpose. Reviews of Polish and German scholars are unanimous in this respect that Lizards had in mind the Culmland detachment from the law of Order and subjecting it to Poland. " The Lizard Society’s document soon appeared with 26 overhanging coat of arms seals belonging to the Prusai nobility. Which were these families? We will never know because the seals have been destroyed, today only on the base of families active operations can be assumed which of them could belong to the society. Nor do we know in which areas the Prusai Lizard Society had their supporters, but certainly can say, it was Pomezania and the Culmland. The Prusai knights filled out loyally their duties to the Teutonic Knights, could not behave otherwise, as by an oath were obliged, had participated in all skirmishes on the Crown border, and abroad. As it was during the Order expedition to the island of Gotland in 1398, later in the Dobrzyn land and other skirmishes. The knowledge of their participation comes out from documents when the knight had a loss of horse, that later was compensated. The Prusai loyal attitude did not create any suspicion. Modern German and Polish scholars are conducting an auction with the names of the knights and their national belongings, who were Polish and who German, but not taking into account them being Prusai. 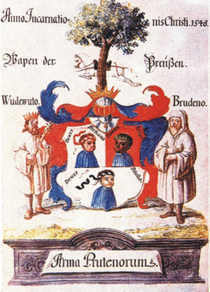 The deciding reason often taken on what rights their land was bought, Polish or German, as well their coat of arms always led them to be Polish. Of course, that was not true. Recently our quick investigations noted that the same amount of Prus families name with the coat of arms Prus I, II, III (about 800 family names), easily can be doubled with so-called Polish nobility coats of arms. Therefore historians of both nationalities are in solidarity, for both of them talking about Prusai people and bringing them into attention is uncomfortable, much more convenient to say as Poles or Germans. At the beginning of the fifteenth century preparations were in full swing for armed conflict. This conflict ultimately had to determine who was going, not only to be the landlord of Prus land, but also in this part of Europe. No doubt the Lizard Society in the greatest secrecy was in contact with the immediate environment of the king Wladyslaw Jagiello and may have been the sole and direct contact with him - was wary with Polish noble circles. The Prusai with Poles they did not share friendship and confidence, and in addition Poles were surrounded by Teutonic informers. Co-operation was so secret that none of its secrets have ever been discovered, only its fragments are known from the post facts, evidence from the Teutonic Knights. The long preparations ended, on the 15th of July 1410 at the fields of Grunwald, battle began. The Prusai Lizard knights, and others Prus lightarmed forces, appeared in a large numbers on the field of Grunwald, the greatest battle of the Middle Ages. The guides of Jagiello’s troops were Prusai, their leader was in direct contact with Lizards. By the historians were said to be Polish, such an argument based on their supposed to be Polish coat of arms is wrong. Polish heraldry remains in the nineteenth-century mess. The Teutonic Knight’s left wing, lightarmed formation, was approximately 10000 to 15000 armed, out of them at least 5,000 were Prusai. The battle started with the Lithuanians attacking this wing and soon afterwards they retreated from the battlefield. What has happened? Did they run away, or were defeated? Could this be a deliberate maneuver, planned before? If Lithuanians fled from the battle of Grunwald and were chased off by lightarmed Teutons (approximately 50% Prusai) would bring total, or at least a significant depletion of Lithuanian army - but towards the end they had returned quite unharmed with a fighting spirit ! The Lithuanians in the right moment have returned to the battlefield and the "chasing" Prusai did not? Maybe, who knows, all the Prusai were killed in pursuit of Lithuanians? Or maybe there was no chase? For sure when the Lithuanians ordered the retreat from the battlefield in their pursuit went the lightarmed. Never ever it has been said that Teutons returned to the battlefield and between them there was around 5000 Prusai. Both, behavior of Lithuanian troops, their sudden almost panicky escape, alleged pursuit after them by the Prusai, and then the return of the Lithuanians without the return of "chasing" Prusai, clearly indicates that in the pursuit the Prusai left the battle and stopped only at their farms. Had they knowledge about the Lizard Society, this can not be excluded, but certainly had no spirit to fight side by side with the Teutonic Knights against the Lithuanians, was none of their interest. The Teutonic knights after the battle were saying, that Prusai at the Grunwald were not fighting in their usual form. To be more specific: they were fighters as much as they wanted to be. The Prusai guile not for the first time was ahead of the Teutonic mind. It should not be forgotten about the blood ties with the Lithuanians and the community hazard with the Order - the same for the Lithuanians as for Prusai. After all, as early as the Battle of Durbe, Prusai forcibly conscripted into the army of the Teutonic Knights and at the decisive moment had defected to the Samogitians leading to the defeat of the Teutonic Knights combined forces. In this situation should not surprise anyone, the behavior of the Prusai lightarmed - it was predictable and constant since and over 130 years. Wherever could and in whatever manner it was possible - they were fighting the imposed rule of the Teutonic Knights. It was not until the battle flared up and towards its end, that revealed was the true intentions of the Lizard Society which was not trifling one, today’s historians, amazingly can not see their behaviour. The Culmland banner of the Lizard Society knighthood, in the camp of the Teutonic Knights remained as a reserve force, and into the battle was to lead the 15 - Teutonic geust banners in the final phase of battle. Their number approximately 6,000 armed, Culmland banner the Prusai about 600 armed. The reseve forces were not to be ignored, estimated as much as 25% of all of the Order’s armed in the battle. That means employing the quarter of all their forces into battle finals, needs not to be explained to any strategist - that it is a dream to have such numbered reserves. The only problem remains, when and how to use these forces, and for the other side how to prevent the use of these reserves. Among them were flags from Germany and Western Europe. Grand Master Conrad von Jungingen commander of the Teutonic Knights, throwing these reserve forces with the strategy for partial surrounding of the heavily armed Jagiello’s knights, to cause among them confusion, breakdown the forces formation, thus in turn would mean the Teutonic Knights victory at the Battle of Grunwald. No need to be a military tactician to imagine the result of such a event and the outcome at the battle of Grunwald, if the Teutonic reinforcements went into the action as Conrad von Jungingen has planned. In the battles history sometimes happens something incredible, the Culmland banner leader with all reserves approaching the battlefield to the apparent distance from Wladyslaw Jagiello rolles the banner, thus giving a signal of their surrender. This results the total confusion of others, not knowing what's going on, three other squadrons acted similarly, without any agreed solidarity. Jagiello quietly looks at the upcoming Teutonic reinforcements and does not escape seeing the enormity of the approaching army - without fear and terror or with certainty to what precisely will occur, because all this has been already planned? The behaviour of reserve forces, that at the start without fight lost some 2,000 men, thus was weakened by 30% of their capacity. The rest of reserves acted in a great chaos, their combat efficiency at a very low. At the same time Lithuanians, Rus and Tatars are returning back to the battlefield - back with vigour and courage, returned from the Prusai pursuers, who at this time most probably were already in their farmlands - as planned, hit the reserve flags from the back, but not the Culmland banner, that was still in the formation, so instead the boiler to the Jagiello knights they found themselves in it. This situation for the Crown forces could have been very disatrous, because the knights of the reserve were not dressed with black crosses and Polish knights did not recognize them as the enemies. In the consequence of what has happened, Jagiello heavily armoured knights gained an advantage over the Teutonic Knights and the great battle resulted in the victory over Germanizm. Today, researchers in a spirit of Polish patriotism do not want to consider such obvious events, what they copy over and over, is completely different and false. There was no such a case in the history that one banner could turn upside down the tide of the battle, and much more, without suffering a single loss. The Jagiello had known, that Culmland banner will be in the battle, and will not hit him, will not be against the Crown. It should be noted how it was a remarkable planning precision to outwit all the elements of the Teutonic Knights - with certainty and almost bordering with arrogance, that there will be no uncertainties and surprising. This certainty can only occur in the case of one family in which each member knows what the trick his brother will do. For Poles remained the glory of satisfying their pride, for Prusai was waiting disaster . The another unmatched fact in the history, is the knighthood oath perjury, it was on a par with the loss of knighthood honor. As this event shows the ethos of honor was above the obedience to the Teutonic Knights service, represented the interests of their own ethnos, to the Prusai people. The loss of honor among elite of such knights, could not have been and was not for privileges, private interests or a separate price for, as say a choir of historians. The Prusai and the freedom for Prus people was for them of the greatest value. The Jagiello victory was not the final issue with the Prusai military effort, without suffering any losses in the battle, took immediately action against the castles remaining in the hands of the Order, and began to clean out of their crews and pass them into hands of Jagiello. Immediately after the battle, the castle Kowalewo became a prey of Prusai, two Lizard’s knights Jan of Pulkowo, Nicholas Rynski brother of the Culmland Banner leader and the other Nicholas I of Pilewice "took everything that was there and the men dragged them out of the castle by their beards and released them with the castle to Poles ". At the same time the knight Nicholas of DURAG, cleans the castle in Osterode from Teutons seizing their belongings. Later trace of him gets lost, in unknown circumstances was stabbed to death. Local knighthood in Olsztynek confiscates the castle from the hands of the Teutons and hands over to Jagiello. Loyal with the Order, knight Dietrich von Spirau (from Dylewo) for the murder of a servant Heinemana Brock a faithful of the Order runs to Poland, after his return found stabbed to death. Gunter of Dylewa opposition knight, fearing for his life, after the battle spends few years for safety in Poland. Albrecht Karschau a knight gets the castle in Balga driving out the Order’s brothers. The Lizard’s member Jochart bei Rastenburg with Bardynem (Mayor of Ketrzyn) acquire Ketrzyn castle and expel the Order knights. Later for this offense both were beheaded. Zbylut (vel Zębowski Szambowszky Pomian coat of arm) for an unworthy act at the battle of Grunwald, the surrender with a 23-armed alderman in Bydgoszcz, imprisoned, his living was not known anymore. Nobody, risks loss of his life for castles - after all these castles were defended by Order , not the mercenaries with pay, and the Teutonic knights from those castles lived and ruled. History once again repeated itself: after the battles of the Rzadz, and Durbe, Podkarvis and Fiugajki - the Order and their law was on their knees while only remaining a few castles left for the attack and had only to finish them off and take over the imperial authority over the lands of Prusai. Willingness was short with Poles. Or else once again unknown Polish self-interest prevailed. From these battle episodes, we go to different once, to illustrate the commitment of the Prusai at the Battle of Grunwald, because for them it was not only the battle but an another great revolt against the yoke of Germanizm and the hope for freedom with the Crown alliance. The Prusai invested everything, trusting in the Crown, but did not know that Crown was very weak and Poles with indifference to the Prusai. This Poland’s foolishness was going to cost Poles very dearly, three hundred years later, loss of independence for nearly 130 years, the loss of the state continuity, results clearly visible up to this day. Time of independence, unfortunately, but for Poland do not always works in her favor. The German Order with Master von Plauen, after Grunwald failure quickly becomes re-organized, cooled down, started to settle down the revenge with Prusai, the Lizard Society, they were declared as the guilty for the Teutons massacre at Grunwald. At first went Prusai knight, Nicholas I of Pilewice (Pilewski) at whose property the Crusaders made a revision with findings. Why the suspicion fell on him is not known, one can only suspect that it was a denunciation. The secret had to be betrayed, on his estate were found written documents attesting to his cooperation with the Crown. Nicholas I of Pilewic was the Lizard Society representative for contacts and cooperation with the Crown. Found documents were a hostile correspondence against the Order and scraps of Polish pennants, most likely the Crown messenger’s symbols in contacts, for the Order it was a sufficient proof who was he. His activities must have been much broader, but this knowledge is not available. The Teutons having sufficient evidence, imprisoned him, took him to Grudziadz, there at the beginning of October 1410 without a court trial beheaded him. Within jiffy, this event went spread among the Lizards, many of them managed to escape seeking asylum in the Crown. They were Rynski Nicholas and his brother John of Pulkowo (he died later in Poland), Janusz from Szczuplinek (ancestor of General Jan Henryk Dabrowski), Frederick of Kitnowo, Gunter of Dylewo and many others have fled to Poland in the face of new threats. The Thorn peace treaty was signed on the 1st February 1411 year, that included an amnesty for all who have betrayed the Teutonic Knights, but von Plauen was not going to give up the revenge on Lizards. He had falsly created a conspiracy of Wirsberg, which supposed to have overthrow him and the Lizards were to participate in the plot. This trick authorized him to catch Nicholas Rynski as one of the conspirators, without a trial, and as Nicholas I of Pilewice was beheaded in Grudziadz. At the Culmland Banner leader’s fate we end this topic, and move on to another, equally interesting period of Prusai for their freedom struggle and as well very important. It would be wrong to say that the Prusai knights alone achieved their success in getting the most of Teutonic castles. The Teutonic Knights going into the Grunwald fields, left the castles defense in control of retired knights. However, the local population from an area was spent at large, and completed the defenders. It is this population, that was a hero in the acquiring the castles, knights at the castle gates, they served only a password, demobilize the Order’s knights and open the gates, this could not be otherwise. Most certain, that the public did not know the secrets, the provisions of the Lizard Society, but they knew them differently, that the Prusai Lizard Society was created by the Prusai knights. It is a common knowledge, that the Prusai had a mutual respect for each other, regardless their wealth. Jagiello had acted with respect to Prusai, but his entourage "Polish Court" certainly without friendship attitude. The Prusai giving up the captured castles to Jagiello, had to withdraw their crews, have been replaced with Polish crews. Why not leaving the Prusai knights at castles with their crew, in addition locals were the Prusai population around an area, there were no Poles only the Prus people, thus the castles could be the guarantee against Teutonic invasions and the Prusai themselves could easily manage to deal with them, at that time there were not too many ethnic German settlers. This state of the situation could also tame their settlers, as basically they were a cowardly people. To continue and look further at the core of this silliness has no sense, it has the same symptoms of Polish behaviour as in the other provinces of Poland and also at different historical times, that finally led Poland to the loss of her indipendence. 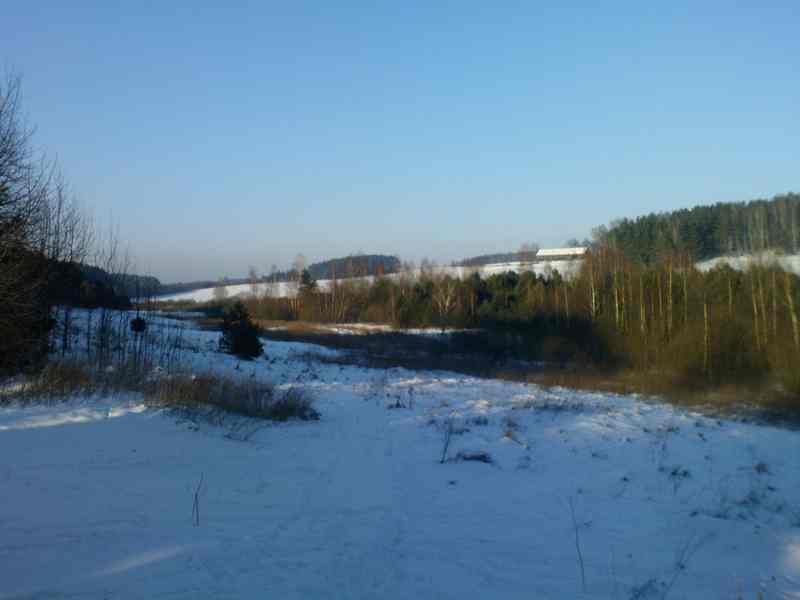 After the Peace of Thorn the border between the Teutonic Knights - Poland was still torn by armed skirmishes. Jagiello won the battle, the war was not won and for that as a proof Crown had to wait for not too long, it was the partition of Poland and finally in 1939 year German Guderian's panzer divisions attacked the II-nd Republic from the Prusai land. All of prey after Thorn peace treaty were returned to the Order, as well as all the castles, the peace treaty was one big mockery for the Crown, the great victorious battle turned into a joke. There was no such a case in the history that the great decisive battle, that soundly defeated enemy who at the end becomes the winner. So it was at the Grunwald. About Grunwald do not teach at school children the falsehood ! Could there be a rational society ? The Prusai Lizard spirit, although in every way kept in a secrecy, was seething and not much was needed that again to be felt its presence. As Karol Gorski says "That's been the case Skolimów (Skolimowski family), which roiled relations between Prussia from 1443 to 1446 and became a link between the establishment of the Prussian Union of accidents that directly preceded and prepared the uprising." This is an ambitious saying, but minor incidents in the history are known that have later changed the course of history. In this case with the assets of international publicity, associated with harm to the Prusai family with all the Teutonic cheatings, definitely kept the temperature of the Prusai spirit. The Prusai spirit, was all over the Prus land, although not everywhere with the same degree, experience, intensification, also its character could have been different, but one thing was for certain, that there was not much needed for it to be aroused. Spirit of the Lizard Society remained even more, instilled with the peasants population of indigenous origin, it is not that as easy, as it seems for historians, their minds do not want Prus people to register, that the Prusai have never lost their identity. However, as you read the "Geographic Dictionary of the Polish Kingdom" about the villages in Prus land, looks that in the XIV century the entire Poland’s population was living in the Prusai land. The question remains who are the Poles now living in the present Poland, an interesting question, and how many can answer this question? Were Poles living in the Prus territory and on the Polish territory were Prus people? Interesting exchange, is not it ? Therefore we should honour Poles, because they voluntarly were sacrificing their lives for the Prus land, is that true ? "In many settled around the local nobility, such as the Polish and German unfriendly toTeutonic Knights, first the anti-order in connection Lizards (Eidechsengenossenschaft) fused, in Lisewo usually held their meetings, as often, the 1450, 1451, 1452. The mayor of the nearby castle of the Teutonic Knights Lipinki had a duty to watch over the proceedings of these meetings and the great master of them was reported. Also, land courts (Landding) took place in the manor house at Lisewo. Year 1452 local land peasants also joined to the Lizard nobility. 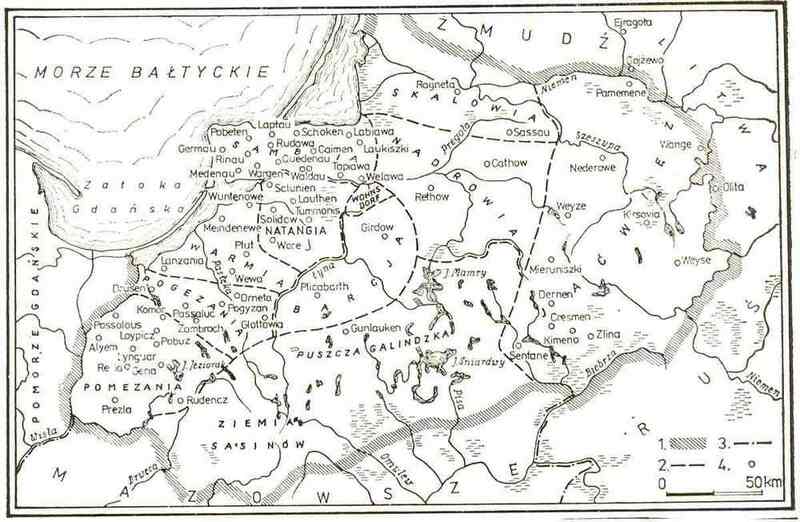 As speculated in Lisowo for such meetings, the first salutary thought to expel the Teutons and surrender to Poland. Since the meeting fell out in large numbers, usually take place in the church. " Remains the question, how many settlements before the Thirteen Years war began were of such attitude? Many more facts could be added, in order to provide the evidence how Prusai favored and helped the Crown in her awkwardness with German Order, despite the fact that the indigenous people suffered the most during the Battle of Grunwald. As the Polish procession went from the battlefield to Malbork castle, hungry Jagiello army did not ask the Prusai peasants if this is their last pig or last heifer, just took it. And the worst was yet to come. The restrictions by Teutonic Knights to the Prusai people survivors of holocaust were the most debasing of humanity, and of all European nations only the Germanic race has a such brutality in their genes. To describe these evils, volumes would be required. The Germans, predominantly colonized the Prusai lands in the Vistula delta, including coastal areas, and the most fertile areas, Prus people in these areas were denied admission. Interior was ubiquitous with the Prusai peasants as well as the Prusai nobility, it is known that the Prusai villages under German law have not been Germanized and as mentioned by K. Gorski "to the end of Order rule in Natangia, remains are of Prus even in the area that are mostly German settlement the Prusai are everywhere ". The Poles great mistake, was to regard them as the Germans, the Prusai nation identified themselves and always had a sense of self being, and certainly it was not on their way to be with the Teutonic Knights. The turning point in their Germanization was the economic ruin as a result of “Thirteen Years War” and later was the reformation. As a slave labour, the Order have never tried their denationalization and as well reverse them from their so called paganism, it would be to the detriment of the Germans. The natives in the Prusai Union were active in four provinces, this time divided into bishoprics, Culm, Pomezan, Sambian and Warmian, focusing not only Prusai ethnos, but also some Polish and German. 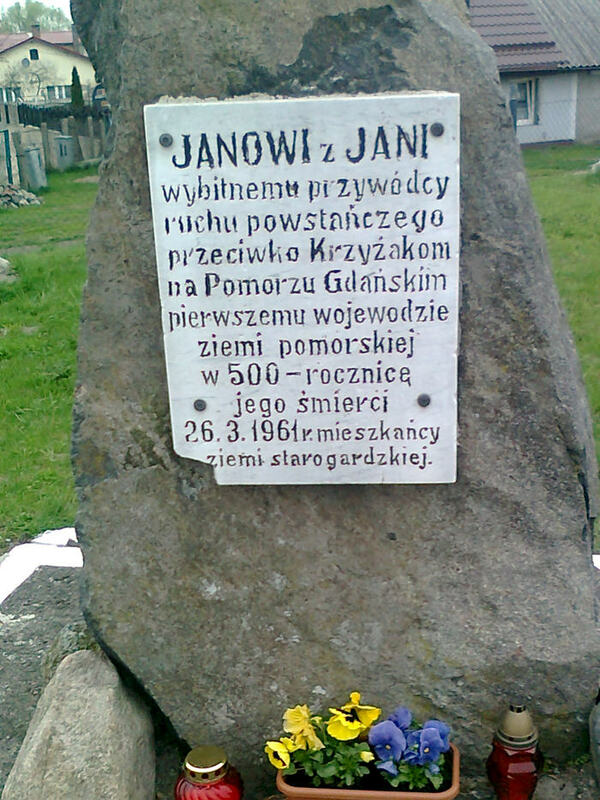 In the Polish ethnos, because of the injustice that the Order have used only to the natives, between Poles were hidden many Prusai natives. The XV-th century is characterized by the increased Prusai escapes from the German yoke and they colonized their native now empty Prusai areas such as Sasinia (Lubawski land) Galindia and Kurpie. The Order fell into financial troubles, the times of the Prusai conquest, conversion into Christianity has ended. As well has ended, free coming from Germany and Western Europe knights and bandits for the glory, lust, desire for fame and fun to murder the Prusai. A new era for the castles, they had to fill up with mercenaries and pay them wages, and for this reason, cash with the Order not always been available. In return for the overdue pay to mercenaries, the Order bestowed with the Prusai land. Such was the beginning of the Junkers formation. The costs were burdened with peasants and townspeople. Thus began a multi ethnic discontent with the most numerous and significant participation of indigenous Prusai against the ruthless population’s economic exploitation. We will only follow what was left with the spirit of Lizard Society among the Prusai, their activity and the final result of their struggle. The study will not be considered with the dissatisfaction accents but only on the Prus people participation. The war to be soon started was a war of many interests, not just social groups, but also with an international character including clergy participation. On the initiative of the Prusai knights in the year 1440, confederation was formed of landowners and all other citizens under the name of the Prusai Union. At the head of the Privy Council stood John Bazynski of unknown ethnic group, at his early days supported the Teutonic Knights ( truly or falsely? ), members of the family supported the Polish King and one of them the Order, thus protecting their estates. They beat a vast fortune by lending money to the King, and their close cooperation with the Polish elite acquired for the family a great political standing. John himself ended his life in poverty and the family did not survive many generations. The Prusai Union refused an obedience to the Knights, did so while adopting King Casimir Jagiellon authority. Polish Clerics were opposed to this Alliance, feared the uprising of the Prusai and the King had many difficulties. On March 6th 1454 year act was completed of Prusai incorporation, confirming for people of Prusai equal rights and their previously rights kept, acquired similar to the Polish residents as a result it meant the liquidation of the Order in Prus land. The Prusai Union army began its activities against the Teutonic Order and the Crown joined them on April 21st 1454 year, this struggle received the name of the Thirteen Years War. Keeping this war long and very costly, demonstrated Polish incompetence in the war conduct, so much different from the a single battles. The same applies to a far-reaching Polish national politics. This war has a very generous literature and we will not develop this theme as it's not what we want, only what is part of Prusai, and also a glance at, how it ended for them. At first we take an example, the history of the Prusai knight a grandson of Nicholas I of Pilewic, Nicholas III of Pilewic, and some others. The Pilewski Prusai family, often known as von Pfeilsdorf, never forgotten with all their members about Prusai identity, their memory of the ancestral roots were cherished for centuries. Nicholas III Pilewski son of John II Klec a member of the Prusai Union, was growing up in a lineage in which the memory of their nation and the Prusai ancestors never died. Has been knighted in 1457. In the Thirteen Years War heavily involved with the family on the side of Polish Crown. The high position of his father, John II of Elbing district, where were Pilewski land, his role in representing Prusai been gradually growing, Nicholas III, his honesty and integrity has led him to a great respect from the local population but not outside with the "Polish Lords". In time, Nicholas III has become one of the most trusted men in the Prusai Union as well as with the King Casimir. As a young knight resided at the castle in Morag, later on behalf of the Prusai a commander at the castle in Szczytno. In the year 1460, present at the surrender of Teutonic castle Malbork. In the same year on behalf of the King a deputy to Gdansk. 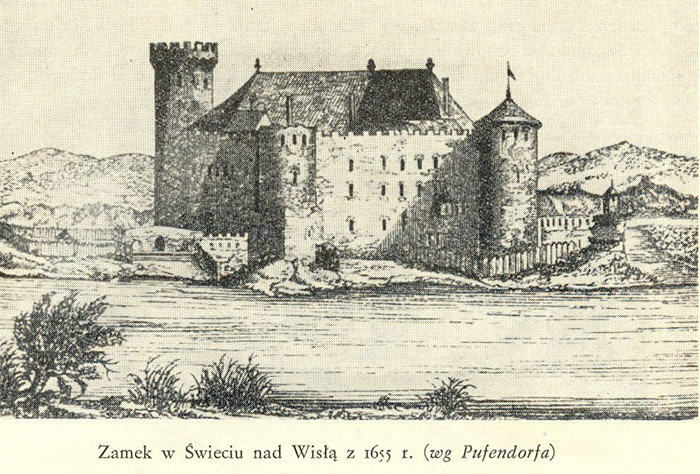 That same year commands mercenaries of Torun, sent by Vistula to the relief Swiecie castle. The 25th September 1461 he participates with the Legation of Prusai Union, and the same in 1466 in Piotrkow, with an appeal to the King, who at that time was in Bydgoszcz, to activate fighting in the eastern part of Prus territory. This shows the great far-sightedness of the Prusai, to end with Teutons and incorporate the Prusai into the Crown. As a Culm Castellan and member of the Prusai Council is involved not only in military missions, but also in a number of diplomatic missions at the request of King Casimir. The Prusai Council was established to manage the Royal Prusai as part of Poland. Important to emphasize that Nicholas III was not alone as a Prus, in his surroundings were many Prusai knights and they actively supported him, but on the contrary there was no support from the "Polish Lords". 19th May 1467, Kazimierz Jagiellon, Polish king as a token of great confidence appoints Nicholas III a castellan of Gdansk and Pomerania, such a nomination for the first time in the history. 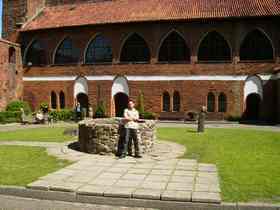 The Gdansk people at the start of the war destroyed their castle, in order, that they did not want the Teutonic Knights, but also did not yearn for the Poles. They were known for their own cathastrophy at the Battle of Grunwald being on the side of Teutonic Knights, from their 1100 armed returned only 300. The activities of Nicholas III, the Prusai knights and the local population in the Thirteen Years War, all their efforts did not bring to Prusai any benefits or solutions, but on the contrary a great impoverishment and ruined them all, did not matter that Nicholas was a signatory to Torun peace. "The Polish Lords" came out with the financial benefits and the land possessions, the self interest was prime, including all the ethnic groups, the only exception were the Prusai. His merits to the Crown were very distinct, and in those times had no equal, more, he did not receive any pay for his public service, was free of any charges, proved were free for nothing, and nothing for Prusai was achieved. Not only did the Order burned down his land in Lukta also Legucki mill, the cost of the war was so great that the whole family estate was claimed. King Casimir IV appreciated his merits as well as the state of his property, gave him starosty Tczew. Much different was behaviour of "Polish Lords" to Nicholas III, he was the Senator of the Crown systematically sowed intrigue around him, claiming that he works against the Crown. 4th June 1474 at the Dybowski castle, in the presence of the King he protested against the Crown masters, they accused him of dishonorable behavior and betrayal of the King interests. King rejected all suspicions to Nicholas III, providing the full confidence in him and the Prusai Union. Additionally signed a support, King writes on 9 of June with thousand Hungarian florins to the Tczew mill, and for the court in Zajaczkowo. To the rescue of "lords" comes Master of the Teutons, Heinrich von Richtenberg in 1476 in front of the King accuses Pilewski, that his activities in Livonia are harmful to the Order. And so, in short, as it is not the saga of the family, Nicholas III received a lifetime financial support from King Casimir, and for the rest of his life was performing the King’s diplomatic missions. His life ended in unknown, mysterious circumstances at the Congress of the Crown. The Jagiellonian’s gratitude lasted for some time, family received financial support from the Kings John Olbracht and Alexander Jagiellon, but for the Prusai was no longer relevant. The brother of Nicholas III, Michael Pilewski 1st September 1462 year, in open conflict was attacked by the commander of Polish forces Piotr Dunin causing his and Gdansk reinforcement departure. There have been resentment to Prus people and all was to the detriment of the Crown. The same Michael at the end of the war, participates in the battle of Starogard. 8th of June 1466 he staged with the Tczew Rota standard-bearer providing driving force of 60 horses. But not only were Pilewski, Jan Kolda the Prusai resides in the castle of Nidzica and on the 28 April 1458 is defending the castle in siege of the Teutonic forces, finally applies them a mortal blow, and see the Order failure, at the same time weakenes their forces in Osterode and Olsztynek. Thus the threat of Olsztyn control by the Germans also was eliminated. It should be noticed that most of the Teutonic forces consisted of enrolled indigenous people under duress, the power of the Prusai Union was peasant militia, eagerly with Union because they were under command of the indigenous Prusai knights. They had a great esteem and respect among the local indigenous community. If we go back to the past events, most of the Prusai nobility from Culmland, heirs of Lizard Society were determined to throw off the yoke of German from Prusai land. On the 7th February 1454 the Unionists under the command of the Prusai knight Otto Machwic acquire the castle in Papowo, the later commander of the castle is another Prusai knight, Janko of Targowisko. It was the first prey before the surrender of Torun. Otto Machwic not only known in this event, but also very active in many other missions. The Pokrzywno castle surrendered without a fight, the knight Bartosz of Turznic Prusai from Culmland became in charge of the castle. 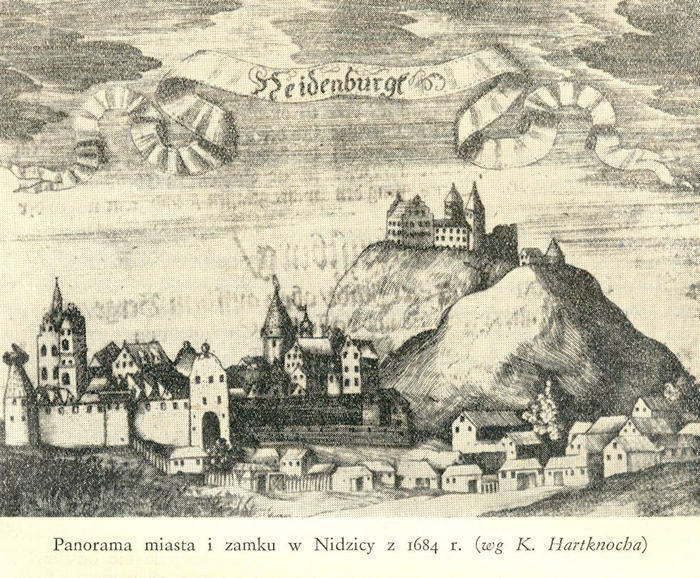 The Radzyn castle’s defensive qualities led that the siege dragged on until 19th of February, the governor was knight Jakusz of Swiety, also from Culmland. 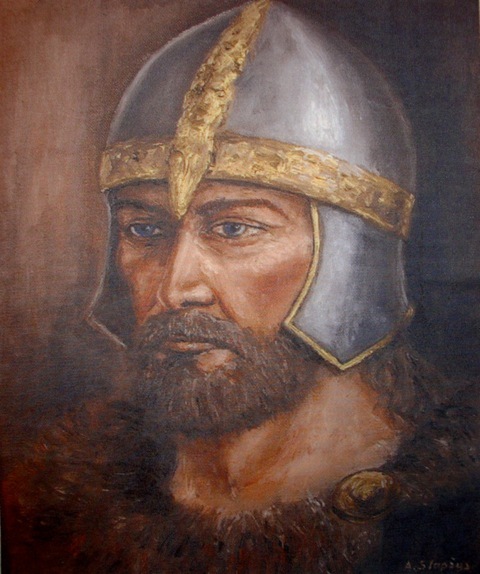 The Union forces took in control the city of Brodnica, led by Jakusz of Osieczka who took the command over the city. Later, he appealed to the Privy Council for reinforcements to come for taking Brodnica castle. After getting Brodnica, other minor castles reported surrender to the Prusai Union, including Lubawa, Kurzetnik, Lidzbark Welski and Bratian. The Prusai knight Ramsza Krzykoski, very active in the Vistula region. Thanks to efficiency of the Prusai knights from the Culmland, armed insurrection was over very quick and efficient. The Prusai Union, their successes in the Culmland greatly helped in controlling the Pomezania province without any military action. The great merit for that can be attributed to the diplomacy of Christopher of Klecewo and on the 7th February he became the governor of the dominion. The Kwidzyn castle, the chapter and its land were with a governor, knight Nicholas of Wroclawka a Pomezanian, soon in the association was reported to be Gardei, Prabuty Susz, Kisielice and Biskupiec. It all happened in only few weeks. More to write how massive this movement it was, too tiring for the reader. The Order’s knights lived in constant fear and panic, within their ranks were forced Prusai recruits, at all times afraid that they will lead to a general uprising. Among Prusai the discontent was growing, that never was noticed by the Crown. That was obvious, could have be seen, when Polish mercenaries landed in Sambia and "rebuked Order’s knights", they mostly were innocent Prusai. This landing was without any effect or any final result, with one only exception that the Grand Master in fear and seeing the growing discontent between the Prusai people, fled, leaving supplies of food and siege equipment, quickly withdrew from Frombork. The Prusai were present everywhere, and the possibility of their total uprising the Germans feared most, the memory of Grunwald defeat perpetuated it further. It was the last chance to eliminate the German disease from this part of Europe. It is not possible to mention all of them, but about Jan of Jani, a prominent Prus, he should see a separate study. Added above picture by Prus Zbych Janowski, also from the excellent, distinguished family, their monography is in preparation. It was an open, active last military uprising Prusai had undertaken, this time not alone but with the Polish neighbour to further their political interests. In the next centuries, indigenous ethnos started to be terminated under the name of Masurians, and as before Prusai, so the Masurians were used and manipulated for various political purposes by the Germans and Poles until their complete and with deliberation dispersion, they always said "we are not Germans, but also not the Poles, we are the locals ". Never in the history of mankind, has been any ethnos, that over the centuries was so deprived of their identity and without any respect and general justice. The King Casimir Jagiellon can be considered as an intelligent ruler, but in fact the control of Polish Crown was with the clergy, "Polish Lords, the royal army commander Piotr Dunin, himself was mediocrity, demoralized middle class, in half-hearted and large military defection, resulted fictional costly war, won by the Crown, for the Prusai it did not bring anything but total economic disaster. If only few weeks was needed for the knighthood of Prusai Union to master Culmland and Pomezania with their flanks castle Nidzica, Szczytno plus Olsztyn without referring to other areas that could be easy under control. Determination of wise strategy, blocking admission from Germany of their supporters, equitable cooperation with indigenous Prusai, were not considered. Negligence after the Battle of Grunwald was also in evidence. Next to be noted, the small presence of native Prusai in the Privy Council, self-interest combined with the "Polish Lords", indigenous people not much were able to accomplish. This war lasted for too long time, this war for some was bringing money, it was enough for a simple strategy pushing the Knights to the sea or to the Konigsberg and decorate them with another Grunwald. None of the historians started this subject, to describe these events as, and to be considered the great Prusai people last uprise. One obvious reason remains, the continuation of the existing historical hypocrisy. Historians in the second Republic when Prusai land Warmia and Mazury was not yet within the Polish borders, they with difference to present ones wrote about Prusai. Never in the history we had, that Poles were interested to revive the Prusai people, and if there was something, then was only the manipulating with these people as in 1920 the Plebiscite. 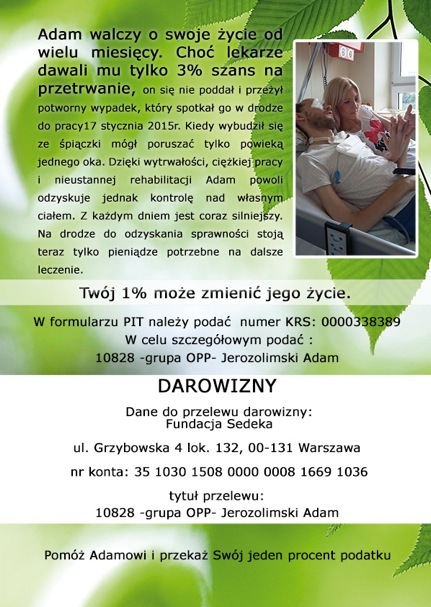 The result of this policy Poland paid a high price, and continue to pay, as one can see will continue to pay. It was not only the "Polish Lords" policy, above all it was the papal clergy and therefore also Polish. The Prusai gambled their future with Poles as an ally. Alliance did not work. Putting such an argument have to be proven. "Common" people, never know what's going on behind the political stage, and when the power is blowing stupid, it is always the case in manipulating and inciting patriotism, until the time when they not needed any more. Top it all, best describes Father Lukaszewicz "If history is to be a master of life you have to tell the truth about Grunwald and Witold, and the truth about Thorn peace in 1411 and 1466." Poland at present, without the clergy influence, in times of raging the foreign capital, with Polish fans of post communizm, and the Prusai people who still remain without the German “humpback”, again, very unwanted ballast. For how long ?